If you are new to macros, you may find my introduction to macros helpful before reading this post. Within this blog, I’ve tried to balance class-specific examples with general principles. Yes, I pretty much speak only Warlock (and to a lesser extent Death Knight), but I try to make sure the basic underlying points are the same no matter what class you play. This post is not like that. See, when you start getting into specific class mechanics you find how each class, each spec even, has nuances and specifics that just don’t apply universally. And a discussion about scripting those nuances should be taken like code samples from a textbook; they might show how to do a task a specific way, but you’ll have to adapt them to suit your needs. Enough with the self-justification. I love playing a Warlock and am proud of it. Here’s how I use macros to help me do it. Warlocks have a variety of buffs that range from simple to apply (Fel Armor, Demon Armor) to complex (Spellstones and Firestones). Let’s start with the Armors. For simplicity, I map the same logical concept to a key across characters, so Z is offensive buffs while X is defensive. On a DK this translates to Blood and Frost presences, but on a lock it’s Fel Armor and Demon Armor. These are the lead spells in front of macros that I can spam while rezzing from a graveyard to get back into the fight. As soon as I rez I start running and spam Z. This applies buffs in order of importance, with Fel Armor and Soul Link being the only essential ones. The other instant cast spells are there for dispel protection, not for real utility. Create Healthstone is last so that if I need to replace a used one I can stop moving at the end of the sequence and create it; otherwise I stop to mount. These macros make use of a reset parameter to allow me to use them in combat to Stance Dance, swapping my armor out as the situation demands. The spellpower buff from Fel Armor is SO good that it’s hard to remember that Demon Armor is often a better option when melée closes the gap. It is equivalent to wearing mail, which is nothing to sneeze at. Resetting allows me to flip between the two as needed. Next up is Shadow Ward. Shadow Ward is an easily overlooked spell that should be keybound for all warlocks, and not just PvPers. There is no excuse for not popping it as soon as you see a shadowform priest, affliction warlock, or unholy DK. Since it’s on my bar anyway, it makes a convenient place to store those other buffs for individual application with modifier keys. Soulstones are a non-combat cast, so I don’t have this one keybound. It creates a Soulstone if you don’t have one already, and applies it to the target if one exists. Related to the Soulstone macro are the Spellstone/Firestone macros. The Spellstone is an essential buff that is a real hassle to use; you have to apply it directly to your main hand weapon via the character pane and each stone has charges. These macros automate that. They will create the stone if it doesn’t exist and apply it to your weapon if it does, so you may need to fire it twice to get the buff. I keep two copies because the Spellstone is superior for nearly every single Warlock build EXCEPT for deep Destruction, which is what I play right now. Since there is always a right choice as to which stone to use, I don’t try to save space by combining them — just use the appropriate one for your spec. I don’t macro creating Healthstones or Ritual of Souls, though I do include using Healthstones in my healing macros. Finally, before I started using an Abyssal Bag to hold my Soul Shards, I kept them in my normal bags and used a macro to clean them out when I needed more space. Let’s start with the basic grinding macro most Warlocks should level with. This should be your primary weapon, stacking DoTs in order of least aggro and damage (and longest duration) first. Because the instant-cast spells are first, you can cast it while moving, tabbing your way through mobs with the first two spells until you settle on one to drain tank. These two macros allow me a lot of flexibility in how I dot up a target, without requiring 4 buttons. On the run? 1,1. Have more time for setup? 2,1,1,2. Or 2,2,1,1. Refreshing dots on a boss? Haunt and UA cycle nicely (notice no timed reset there) while CoA is always ready to go after reset (Haunt refreshes Corruption). I group the spells into instants and stationary casts for two reasons — how much moving I do on the battlefield, and how I map my keys. Keymapping is a whole post to itself, but suffice to say that there are only 7 keys I consider to be in the primary zone, and only 4 of them are for single-target damage spells. So I want to be able to go through my primary and secondary attack sequences with those 4 keys. For affliction, there are 6 spells you must use: Shadow Bolt, Haunt, Unstable Affliction, Corruption, Curse of Agony, and Drain Soul. These macros let me fit all those spells into 4 buttons. Destruction spells are organized with the same goal in mind, though I don’t draw a distinction between instants and casting time spells; Destro pretty much requires to to stand and cast. There is a slight difference in playstyle worth noting. They both are priority-based systems when determining what to cast next, but unlike Affliction, which is about DoT refreshing, Destro is a cooldown-based spec. It’s a subtle difference, but worth noting as it affects macro decisions. There are 4 spells that make up your primary rotation, with 2 optional curses, Elements and Doom, which I’ll talk about later. The rotation varies based on situation and cooldowns. My first rotation starts with Immolate to get that DoT ticking immediately. There is then a brief pause while Chaos Bolt is cast and travels to the target, but then Conflag, CB, and the second Immo tick hit all at the same time for massive burst. Then Backdraft-enhanced Incinerates go to work. I like this for several reasons: it does a huge amount of burst on players while maximizing DoT uptime, it puts Immo right where I want it for later casts, and it’s mostly spammable, with the CDs refreshing at about the right point in the sequence. The CDs don’t line up exactly, but it’s good enough for trash mobs. The second rotation is used when I have a lot of range on my target and need to drop them quickly, but they don’t have that much health. Sometimes called the CICD rotation (Chaos Bolt – Immolate – Conflag – Dead), it doubles as my default Chaos Bolt button. This sacrifices DoT uptime for one massive burst of damage. Follow it up with Shadowburn or Shadowfury for extra punch! The third rotation doesn’t use a new macro at all; it uses the reset features of the previous ones. For boss fights where I want to pump out damage I cast manually, based on cooldown priority. After the first sequence I’m spamming Incinerate while waiting for Conflag and CB to come off CD and keeping my eye on Immolate. Paying attention can yield very good DPS gains on longer fights, so the macros are used only for initial setup. Now, Curses in Destro. Long fights where you’re the only spellcaster? Curse of Doom. In a raid and someone else has Curse of the Elements duty? Curse of Doom. All other times? Curse of the Elements. Because of CoE’s wonderful 5-minute duration, you generally can cast it once and be done with it. I use the following to apply it and then optionally put Corruption on the target. I don’t reset it while on the same target so I can keep spamming Corruption if necessary. If I have to reapply CoE on the target I’ll just click off of them and retarget to reset the sequence. This macro is actually very useful for Destro locks in movement-heavy fights or on Wintergrasp siege engines. You may not be able to cast your normal spells through the WG lag, but at least you can help other people take them down. You can also combine your different summoning spells into a single button. This “whistle” summons my Succubus nearly instantly — I do have to stop moving to cast the Summon spell. Setting focus via macros is a whole separate post, but it’s worth experimenting to see what works for you. Many of the macros here were originally from the WoWWiki page on Warlock Macros. I really recommend you spend some time over there looking at what other people have done and adapting them for your use. And, despite what I said at the beginning of this post, I hope that even non-Warlocks can take some of the macro ideas presented here and find ways to make playing their own classes more enjoyable. When I first started PvPing, I eyed the achievement lists and found one at the bottom that gave me pause: Battlemaster. A title well beyond even Justicar, one that shows complete mastery of the battlegrounds through the Burning Crusade. Okay, there’s a goal to work towards, I thought. Then I started working towards it, and holy moly, is that one hard achievement. Alterac Valley was the easiest of the lot for me to get started on, what with being in my 50s and the Alliance owning that bracket. Warsong Gulch was much worse for me as a Warlock, being a squishy cloth wearer. As I started grinding out the reputation and trying to run the flag, I realized how long of a haul I was in for to get the Battlemaster title. When I started playing a Death Knight, the situation in Warsong Gulch improved dramatically. Achievements which formerly seemed impossible (Iron Man) were trivial, and I could romp through the field with impunity. The experience really opened my eyes as to how some things that are easy with one class can be seemingly impossible for another. So it’s with some awe that I congratulate Jagoex on reaching the pinnacle of battlegrounds with his Warlock. Serious, heartfelt congratulations! So the new, instanced Wintergrasp has been here for a few weeks. Everyone should have updated their mount macros to let them fly when appropriate and not spam general chat with raid invite requests. But how have the changes actually worked out for Wintergrasp? I don’t know about you, but I still have terrible lag during Keep battles. There are still times I cannot cast any spell with a cast time, and we can still win or lose before the interface gives us a chance to react. What’s worse is that the lag can still hit you when you’re NOT in the Fortress. Throwing more than a hundred players together with vehicles without lag is a tough situation to solve; but instancing doesn’t seem to be the fix. Wintergrasp is still a lagfest. Flying has been a mixed blessing. It’s wonderful for collecting resources when the battles are not going on, though aerial combat is somewhat challenging. Living on a PvE server, this is the one zone where you have to watch the skies while fishing… or just accept that you’ll get ganked occasionally. It’s the price for really great fishing. Unlike some of the other BGs that received attention in patch 3.2, the gameplay and strategies in WG are essentially unchanged. I’m not seeing as many matches with huge population imbalances, but that hasn’t changed the strategies. What has changed is how quiet WG has become. WG raids were large social events before the change, with people gathering, talking, joking, buffing, all to get ready to storm the walls. Trade and Dalaran general chat would get spammed; each battle for Wintergrasp was a server EVENT. No more. While you are at least still teamed up with others from your server, the automatic queing has turned Wintergrasp into far less social affair. Organizing and participating in raids required human interaction, which in turn usually led to chatter, jokes, demands for buffs… and actual conversation. I got to know a lot of people on my server from those raids. Now? The pre-battle buffs are gone. No more Mage tables, fish feasts, KINGS PLZ! – none of that. You go in self-buffed like any other battleground. There’s no gathering at the portal, since people queue up and go about their business waiting for it to start. The automatic queuing has really hurt Wintergrasp. I have thought a lot about this phenomenon since 3.2 hit. At first I thought it might be due to lower participation overall, but even full raids are ghosts of the parties they used to be. Yes, players are mercenaries and go where the loot is, and the Argent Tournament offers loot that directly competes with Wintergrasp’s main draws. 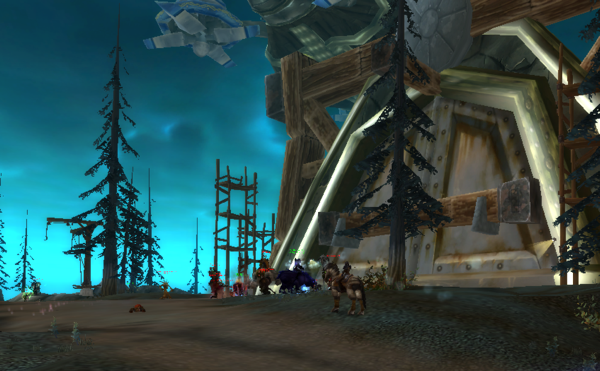 There are fewer incentives to Wintergrasp all the time, but that doesn’t explain why it isn’t a social event anymore. To explain it, I turned to one of the key concepts of Jane Jacobs’ The Death and Life of Great American Cities, which is that urban design that brings a variety of people into physical proximity – squares, short blocks, street-level businesses – creates thriving, safe neighborhoods, while long blocks, highways, and insular housing projects do not. The portal room served as a central square which brought everyone physically together. From there you had access to the Trade and Dalaran General chat channels to organize your raid, while also having a steady stream of /says, /whispers, and /yells to draw from. You buffed people because they were right there; to not do so was to be rude, in public, and because the habitual buffers were noticed and praised. There were always people you could count on to organize a new raid when one filled up. Knowing the people around you is what a community is all about. The steps and inner courtyard served a similar purpose as the portal room for defensive battles. People congregated there for mutual benefit, dueling, and shopping. Wintergrasp was vibrant and alive. Now these spaces are silent, ghosts of their former raucous selves. I’m not complaining about the changes to Wintergrasp — honestly, I’m not. I’m not asking to roll back the patch and go back to the way things were before. I just wish that those changes had actually solved Wintergrasp’s original problems in return for giving up those things I really liked about it. What’s up with the training dummies? I visit training dummies a lot, usually to try out new rotations or check gear upgrades to make sure they’re doing what I expect. But recently, the training dummies have been more… realistic. Almost lifelike, in fact. For example, Cynwulf discovered he could skill up his newly acquired Polearm on a dummy. I’m pretty sure that dummies didn’t allow you to skill weapons before. I’m a little hesitant to post this. If this new behavior is intentional by Blizzard, it’s awesome. I love it. Farming shards is now a trivial matter, just like it should have been all along. But if this is a bug I expect it to be hotfixed pretty darn quick. Which is a pity, because the improved training dummies are really cool.